This server has received 2229277 hits from both ipv4 and ipv6. It’s been a busy week with a Joomla and WordPress usergroup sessions, as well as a meeting with Eurid, the registry for .eu domains. The regular monthly meetup of the London Joomla usergroup took place on Tuesday. Phil from SoftForge gave us some insights into the Akeeba Backup tool. Many people already use the extension to make backups of their site. What is not so well know is that the Pro version (a very reasonable $50 or so for unlimited sites) easily adds the ability to copy the backup to offsite storage. Currently DropBox and Amazon Storage are available. Phil also pointed out the security feature of Akeeba to setup a secret key as attackers could trigger your backup repeatedly and cause a Denial of Service (DOS) attack. This setting is in the top right Parameters button. Akeeba Backup is even being used to non-Joomla websites. 2020Media will setup Akeeba for any customer using our hosting competely free of charge. Just ask! 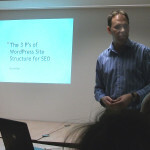 Two talks this week – WordPress SEO and a newbies guide to Custom Post Types. The evening began with a quick roundup of WordPress news (download the podcast). WordPress 3.3 is almost out. New features include a drag and drop interface for adding images and other media. There’s a plugin to check your website for vulnerability to the tomthumb problem. WP Install Profiles is a Drupal-like idea for developers who want to pre-fill their installs with their favourite plugins and themes. 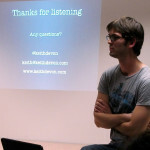 Keith Devon gave us a great introduction to Custom Post Types, which was very useful for the new developer or designer. Simply put, setting up Custom Post types allows you to add a new section to the admin menu for a adding content to a specific type of page that you design. For example if you had staff profiles, you can create a page entry that has boxes for their name, position and job description, and then on the front end display this in a particular way. Download the podcast. The team for the .eu registry were in London to convince the euro-sceptics in the UK that getting a .eu domain is a good idea! Whilst the argument “show you are European” may not be terribly popular at the moment, the EU is still Britains largest overseas trading partner. 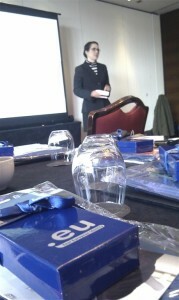 If you run a business that trades with the European area, a .eu domain is a wise choice to link to your website. The .eu domain is 5 years old this year and is now considered a well established and trustworthy domain extension. There are over 3 million .eu domains in use, and it’s the 5th most popular extension in the UK (behind .uk, .com, .net and .org). .eu domains are now available from 2020Media with multi-year periods of 1 to 10 years, and were one of the first domain extensions in the world to offer a registry-backed DNSSEC (secure DNS) support.